There are 25 public beaches in Nice with 22 located between the the Airport and the Port. (See a map). Interspersed among the free, public beaches are 15 "private" beaches with restaurants. Between mid-April and September access to these beaches is limited to clients that pay for a lounge chair and umbrella. The rest of the year, they are open to all. See more on public and private beaches. Nice beaches are composed of pebbles, not sand. These pebbles or small stones are called galets. The good side is that you don't have to worry about sand in your bathing suit. Also, the rocky bottom contributes to the sea's beautiful azure colour. The bad side is, well, obvious. It's generally uncomfortable to walk on the galets although harder on older feet than younger ones. As the pebbles are smooth, sitting or lying on the beach is not uncomfortable but many people prefer a heavy towel or light mattress. Generally, the pebbles are smaller and more comfortable around the centre of the Baie des Anges and larger at either end. Castel and Carras beaches in the east and west respectively have larger stones while Forum in the center has smaller pebbles interspersed with some sand. For walking, I recommend that you buy plastic shoes to protect your feet and make it easier to get in and out of the water. 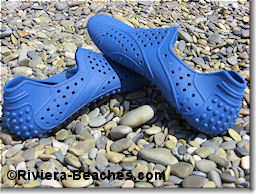 The blue rubber shoes (see photo above left) are one example of rubber shoes that protect your feet from the stones but still enable you to swim. If you confine yourself to a private beach, you don't have to worry about shoes as the beach-restaurants lay down a thick mat that extends nearly to the water's edge. As part of the Mediterranean sea, the baie des anges has very limited tidal movement; there's only a 50cm difference between high and low tides. Wind conditions vary greatly however. From late fall through spring, the bay is subject to windstorms that can turn a sunny day into a battle against the elements. During this period, waves attacking the beach cause substantial erosion and the beach narrows considerably. The jetties that predominate on the western beaches help protect the coast and the city rebuilds the beaches with new galets before the summer season. Even during the generally placid summer months the wind can whip up the sea. Generally, you'll find the sea is calmest and clearest in the morning before 10am. Note that the drop-off on Nice beaches is steep. Conditions vary each year and on each beach but usually you'll be over your head about five meters past the water line. The baie des anges is extraordinarily clean. From mid-May to September the water quality is monitored each week with the results posted here. In addition, small municipal boats collect floating detritus each morning. While the water quality is never unhealthy, there are circumstances when it is, shall we say, less than pristine everywhere. During a rainstorm the Paillon and Magnan rivers swell and rush their waters into the sea at Centenaire and Magnan beaches. As these waters may contain agricultural runoff and other waste from the coastal mountains, the bacterial count rises briefly at these beaches after a heavy rain. Most residents avoid swimming at that time. See more on Nice water quality. When in doubt, check the beach flags or ask one of the lifeguards directly. From May to September there are yellow buoys placed all along the baie des anges at a distance of 300m from the shore. The buoys signal the swimming area and private boats may not pass. Beaches with watersports (Blue Beach and Carras) also place buoys to delimit the area reserved for their activities.